Hybrid and electric cars may be cancer-causing as they emit extremely low frequency (ELF) electromagnetic fields (EMF). Recent studies of the EMF emitted by these automobiles have claimed either that they pose a cancer risk for the vehicles' occupants or that they are safe. Meanwhile, numerous peer-reviewed laboratory studies conducted over several decades have found biologic effects from limited exposures to ELF EMF. These studies suggest that the EMF guidelines established by the self-appointed, International Commission on Non-Ionizing Radiation Protection (ICNIRP) are inadequate to protect our health. Based upon the research, more than 230 EMF experts have signed the International EMF Scientist Appeal which calls on the World Health Organization to establish stronger guidelines for ELF and radio frequency EMF. Thus, even if EMF measurements comply with the ICNIRP guidelines, occupants of hybrid and electric cars may still be at increased risk for cancer and other health problems. Given that magnetic fields have been considered "possibly carcinogenic" in humans by the International Agency for Research on Cancer of the World Health Organization since 2001, the precautionary principle dictates that we should design consumer products to minimize consumers’ exposure to ELF EMF. This especially applies to hybrid and electric automobiles as drivers and passengers spend considerable amounts of time in these vehicles, and health risks increase with the duration of exposure. In January, 2014, SINTEF, the largest independent research organization in Scandinavia, proposed manufacturing design guidelines that could reduce the magnetic fields in electric vehicles (see below). All automobile manufacturers should follow these guidelines to ensure their customers' safety. Following are summaries and links to recent studies and news articles on this topic. According to Theodore P. Metsis, Ph.D., an electrical, mechanical, and environmental engineer from Athens, Greece, modern conventional gas- and diesel-powered automobiles incorporate many EMF-emitting devices. "EMFs in a car in motion with brakes applied + ABS activation may well exceed 100 mG. Adding RF radiation from blue tooth, Wi Fi, the cell phones of the passengers, the 4G antennas laid out all along the major roads plus the radars of cars already equipped with, located behind, left or right of a vehicle, the total EMF and EMR fields will exceed any limits humans can tolerate over a long period of time." Mobile phones’ radiation influence on a homogenous human model located inside a car is studied in this research. One of the novelty of proposed research is earth surface influence consideration under the car on EM field formation inside it. The inner field and its amplification by the car’s walls that in some cases act like a resonator are studied. The problem was solved numerically using the Method of Auxiliary Sources. Numerical simulations were carried out at the 450, 900, 1800 [MHz] standard communication frequencies. Obtained results showed the presence of resonant phenomena inside the car. On Fig. 9 are presented point SAR peak values at the considered non-resonant and resonant frequencies. As it seen, point SAR peak values for resonant frequencies are approximately 5–8 times higher than non-resonant frequencies. Based on the analysis of the obtained results we can conclude that at some frequencies car’s walls acts as the resonator and amplifies the field radiated from the mobile phones; which is cause of high point SAR values inside the human body. For the low frequency the EM field energy deeply penetrates into the human body, while for the high frequencies is mostly absorbed in the skin. The mobile phone’s EM exposure problem for a homogenous human model inside the car is studied using the MAS. MAS were used to simulate earth reflective surface. The obtained results, conducted with the MAS based program package, showed the presence of resonance and reactive fields inside the car, that causes high SAR in human tissues. The reason of this is that at the considered frequencies car’s metallic surface acts as the resonator. So, it isn’t desirable speak on phones for a long time inside the car, that can be hazardous for the cell phone users located in it. Lennerz C, O'Connor M, Horlbeck L, Michel J, Weigand S, Grebmer C, Blazek P, Brkic A, Semmler V, Haller B, Reents T, Hessling G, Deisenhofer I, Whittaker P, Lienkamp M, Kolb C. Letter: Electric cars and electromagnetic interference with cardiac implantable electronic devices: A cross-sectional evaluation. Annals of Internal Medicine. Apr 24, 2018. Cardiac implantable electronic devices (CIEDs) are considered standard care for bradycardia, tachycardia, and heart failure. Electromagnetic interference (EMI) can disrupt normal function … Electric cars represent a potential source of EMI. However, data are insufficient to determine their safety or whether their use should be restricted in patients with CIEDs. Methods and Findings: We approached 150 consecutive patients with CIEDs seen in our electrophysiology clinic … 40 patients declined to participate, and 2 withdrew consent … Participants were assigned to 1 of 4 electric cars with the largest European market share…we excluded hybrid vehicles. Participants sat in the front seat while cars ran on a roller test bench … Participants then charged the same car in which they had sat. Finally, investigators drove the cars on public roads. Field strength was generally highest during charging (30.1 to 116.5 µT) and increased as the charging current increased. Exposure during charging was at least an order of magnitude greater than that measured within 5 cm of the CIED in the front seat (2.0 to 3.6 µT). Field strength did not differ between the front and back seats. Peak field strength measured outside the cars ranged between the values measured during charging and those measured within the cars during testing … Field strength measured inside the cars during road driving was similar to that measured during test bench studies. We found no evidence of EMI with CIEDs ...The electrocardiographic recorder did observe EMI, but CIED function and programming were unaffected. Our sample was too small to detect rare events ... Nevertheless, other evidence supports a lack of EMI with CIEDs. Magnetic fields are generated in gasoline-powered vehicles if the vehicles' steel-belted tires are magnetized (3); average fields of approximately 20 µT were reported in the back seat of 12 models, and those as high as 97 µT were reported close to the tires (4). Similar values were reported in electric trains and trams (5). The lack of anecdotal reports of CIED malfunction associated with such transportation is consistent with our findings. Electric cars seem safe for patients with CIEDs, and restrictions do not appear to be required. However, we recommend vigilance to monitor for rare events, especially those associated with charging and proposed “supercharging” technology. Small children and infants sitting in a safety seat at the rear part of the vehicle is a common occurrence. Children have smaller physical dimensions and, thus, their heads are generally much closer to the car floor, where the MF strength has been reported to be higher due to tire magnetization and the operation of the underfloor electrical systems (6, 7). The matter of children being potentially subject to greater magnetic field exposure may be relevant as leukemia is the most common type of childhood cancer (8). In particular, Ahlbom et al. (9) and Greenland et al. (10) indicated that the exposure to 50 and 60 Hz MF exceeding 0.3–0.4 μT may result in an increased risk for childhood leukemia although a satisfactory causal relationship has not yet been reliably demonstrated. Also, it was reported that a combination of weak, steady and alternating MF could modify the radical concentration, which had the potential to lead to biologically significant changes (11). ... the B field values measured at location #4 (floor in from of rear seat) were the highest, followed by values from location #3 (rear seat cushion), #2 (child’s head position) and #1 (adult’s head position) (p < 0.012, α = 0.05/3 = 0.017). There was a significant difference between the driving scenarios (F(3, 117) = 3.72, p = 0.013). The acceleration and deceleration scenarios generated higher B fields compared with the stationary and the 40 km/h driving scenarios (p < 0.01, α = 0.05/3 = 0.017) while no difference was identified between acceleration and deceleration (p = 0.16). ... The results demonstrate that the induced E-field strength was lower for the infant model compared with that of the adult in terms of both the head and body as a whole. The infant was reported to have higher electrical conductivity (29) but there was no database dedicated to the infant. Furthermore, below 1 MHz, the database was hard to be measured and the uncertainty was large (30). Therefore, we would not include the issue in the study. Although several SCs (spectral components) on higher frequencies have been observed (can spread to 1.24 kHz), the spectral analysis revealed that the SCs concentrated on bands below 1000 Hz. The EVs under test used aluminum alloy wheel rims, which have low magnetic permeability. However, the steel wire in the reinforcing belts of radial tires pick up magnetic fields from the terrestrial MF. When the tires spin, the magnetized steel wire in the reinforcing belts generates ELF MF usually below 20 Hz, that can exceed 2.0 μT at seat level in the passenger compartment (6). The measurement did not identify the ELF MF by different sources because the purpose of the study was to investigate the realistic exposure scenario for the occupants. To note, degaussing the tires or using the fiberglass belted tires can eliminate this effect and provide the MF results solely introduced by the operation of the electrified system. ICNIRP proposed guidelines to evaluate the compliance of the non-sinusoidal signal exposure(3). The measurements rendered the maximal B field at the level of one-tenth to several μT, far below the reference level of the guidelines (e.g. 200 μT for 20–400 Hz). The similar non-sinusoidal MF signal magnitudes can only account for 6–10% of the reference levels according to the previous reports(32). However, as noted in the Introduction, ‘… 50 and 60 Hz MF exceeding 0.3–0.4 μT may result in an increased risk for childhood leukemia’. Therefore, it is necessary to measure the MF in the EVs to limit the exposure and for the purpose of epidemiological studies. In this study, we measured ELF MF in the rear seats of ten types of EVs. The measurements were performed for four different driving scenarios. The measurement results were analyzed to determine the worst-case scenario and those values were used for simulations. We made numerical simulations to compare the induced E-field strength due to the physical difference between children and adults using detailed anatomical models. The results support the contention that the MF in the EVs that we tested was far below the reference levels of the ICNIRP guidelines. Furthermore, our findings show that children would not be more highly exposed compared to adults when taking into consideration of their physical differences. However, the measurement results indicated that further studies should be performed to elucidate the concerns on the incidence of the childhood leukemia for infant and child occupants. The external fields in the proximity of electric vehicle (EV) wireless power transfer (WPT) systems requiring high power may exceed the limits of international safety guidelines. This study presents dosimetric results of an 85 kHz WPT system for electric vehicles. A WPT system for charging EVs is designed and dosimetry for the system is evaluated for various exposure scenarios: a human body in front of the WPT system without shielding, with shielding, with alignment and misalignment between transmitter and receiver, and with a metal plate on the system for vehicle mimic floor pan. The minimum accessible distances in compliance are investigated for various transmitting powers. The maximum allowable transmitting power are also investigated with the limits of international safety guidelines and the dosimetric results. Measurements were conducted to investigate electric and magnetic fields (EMFs) from 120 Hz to 10 kHz and 1.2 to 100 kHz in 9 electric or hybrid vehicles and 4 gasoline vehicles, all while being driven. The range of fields in the electric vehicles enclosed the range observed in the gasoline vehicles. Mean magnetic fields ranged from nominally 0.6 to 3.5 µT for electric/hybrids depending on the measurement band compared with nominally 0.4 to 0.6 µT for gasoline vehicles. Mean values of electric fields ranged from nominally 2 to 3 V m-1 for electric/hybrid vehicles depending on the band, compared with 0.9 to 3 V m-1 for gasoline vehicles. In all cases, the fields were well within published exposure limits for the general population. The measurements were performed with Narda model EHP-50C/EHP-50D EMF analysers that revealed the presence of spurious signals in the EHP-50C unit, which were resolved with the EHP-50D model. In electric vehicles, passengers sit very close to an electric system of significant power. The high currents achieved in these vehicles mean that the passengers could be exposed to significant magnetic fields (MFs). One of the electric devices present in the power train are the batteries. In this paper, a methodology to evaluate the MF created by these batteries is presented. First, the MF generated by a single battery is analyzed using finite-elements simulations. Results are compared with laboratory measurements, which are taken from a real battery, to validate the model. After this, the MF created by a complete battery pack is estimated, and results are discussed. Passengers inside an EV could be exposed to MFs of considerable strength when compared with conventional vehicles or to other daily exposures (at home, in the office, in the street, etc.). In this paper, the MF created by the batteries of a particular electric car is evaluated from the human health point of view by means of finite-elements simulations, measurements, and a simple analytical approximation, obtaining an upper bound for the estimated MF generated by a given battery pack. These results have been compared with ICNIRP's recommendations concerning exposure limitation to low-frequency MFs, finding that the field generated by this particular battery pack should be below ICNIRP's field reference levels, and conclusions concerning the influence of the switching frequency have been drawn. Finally, some discussion regarding other field sources within the vehicle and different vehicles designs has been presented. Due to the wide variety of both available EVs and battery stacks configurations, it is recommended that each vehicle model should be individually assessed regarding MF exposure. This article describes a study of magnetic field exposure in electric vehicles (EVs). The magnetic field inside eight different EVs (including battery, hybrid, plug-in hybrid, and fuel cell types) with different motor technologies (brushed direct current, permanent magnet synchronous, and induction) were measured at frequencies up to 10 MHz. Three vehicles with conventional powertrains were also investigated for comparison. The measurement protocol and the results of the measurement campaign are described, and various magnetic field sources are identified. As the measurements show a complex broadband frequency spectrum, an exposure calculation was performed using the ICNIRP “weighted peak” approach. 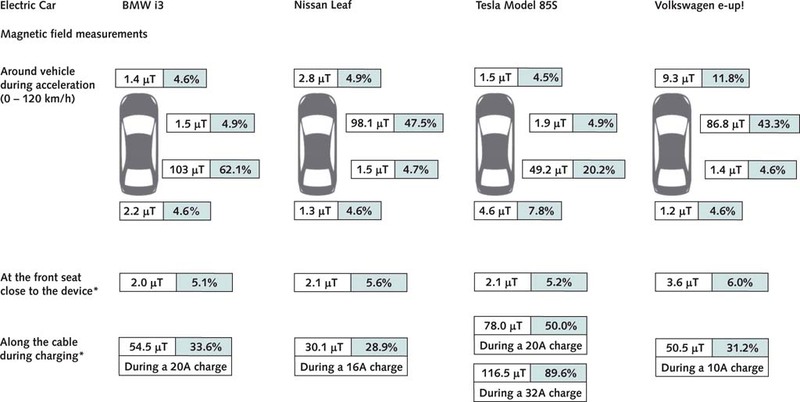 Results for the measured EVs showed that the exposure reached 20% of the ICNIRP 2010 reference levels for general public exposure near to the battery and in the vicinity of the feet during vehicle start-up, but was less than 2% at head height for the front passenger position. Maximum exposures of the order of 10% of the ICNIRP 2010 reference levels were obtained for the cars with conventional powertrains. This study characterizes extremely low frequency (ELF) magnetic field (MF) levels in 10 car models. Extensive measurements were conducted in three diesel, four gasoline, and three hybrid cars, under similar controlled conditions and negligible background fields. Averaged over all four seats under various driving scenarios the fields were lowest in diesel cars (0.02 μT), higher for gasoline (0.04-0.05 μT) and highest in hybrids (0.06-0.09 μT), but all were in-line with daily exposures from other sources. Hybrid cars had the highest mean and 95th percentile MF levels, and an especially large percentage of measurements above 0.2 μT. These parameters were also higher for moving conditions compared to standing while idling or revving at 2500 RPM and higher still at 80 km/h compared to 40 km/h. Fields in non-hybrid cars were higher at the front seats, while in hybrid cars they were higher at the back seats, particularly the back right seat where 16%-69% of measurements were greater than 0.2 μT. As our results do not include low frequency fields (below 30 Hz) that might be generated by tire rotation, we suggest that net currents flowing through the cars' metallic chassis may be a possible source of MF. Larger surveys in standardized and well-described settings should be conducted with different types of vehicles and with spectral analysis of fields including lower frequencies due to magnetization of tires. In hybrid cars, the battery is generally located in the rear of the car and the engine is located in the front. Electric current flows between these two points through cables that run underneath the passenger cabin of the car. This cable is located on the left for right-hand driving cars and on the right for left-hand driving cars. Although in principle the system uses direct current (DC), current from the alternator that is not fully rectified as well as changes to the engine load, and therefore the current level, can produce MFs which are most likely in the ELF range. While most non-hybrid cars have batteries that are located in the front, batteries in some of them are located in the rear of the car, with cables running to the front of the car for the electrical appliances on the dashboard. 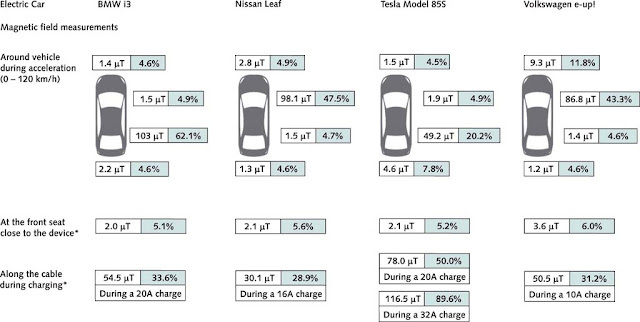 In this study, all gasoline and diesel cars had batteries located in the front of the car. ...the percent of time above 0.2 µT was the most sensitive parameter of the exposure. Overall, the diesel cars measured in this study had the lowest MF readings (geometric mean less than 0.02 μT), while the hybrid cars had the highest MF readings (geometric mean 0.05 μT). Hybrid cars had also the most unstable results, even after excluding outliers beyond the 5th and 95th percentiles. With regard to seat position, after adjusting for the specific car model, gasoline and diesel cars produced higher average MF readings in the front seats, while hybrid cars produced the highest MF readings in the back right seat (presumably due to the location of the battery). Comparing the different operating conditions, the highest average fields were found at 80 km/h, and the differences between operating conditions were most pronounced in the back right seat in hybrid cars. Whether during typical city or highway driving, we found lowest average fields for diesel cars and highest fields for hybrid cars. Overall, the average MF levels measured in the cars’ seats were in the range of 0.04–0.09 μT (AM) and 0.02–0.05 μT (GM). These fields are well below the ICNIRP  guidelines for maximum general public exposure (which range from 200 μT for 40 Hz to 100 μT for 800 Hz), but given the complex environments in the cars, simultaneous exposure to non-sinusoidal fields at multiple frequencies must be carefully taken into account. Nevertheless, exposures in the cars are in the range of every day exposure from other sources. Moreover, given the short amount of time that most adults and children spend in cars (about 30 minutes per day based on a survey of children in Israel (unpublished data), the relative contribution of this source to the ELF exposure of the general public is small. However, these fields are in addition to other exposure sources. Our results might explain trends seen in other daily exposures: slightly higher average fields observed while travelling (GM = 0.096 μT) relative to in bed (GM = 0.052 μT) and home not in bed (GM = 0.080 μT) . Similarly, the survey of children in Israel found higher exposure from transportation (GM = 0.092 µT) compared to mean daily exposures (GM = 0.059 µT). Occupationally, the GM of time-weighted average for motor vehicle drivers is 0.12 μT . Tell RA, Sias G, Smith J, Sahl J, Kavet R. ELF magnetic fields in electric and gasoline-powered vehicles. Bioelectromagnetics. 2013 Feb;34(2):156-61. doi: 10.1002/bem.21730. We conducted a pilot study to assess magnetic field levels in electric compared to gasoline-powered vehicles, and established a methodology that would provide valid data for further assessments. The sample consisted of 14 vehicles, all manufactured between January 2000 and April 2009; 6 were gasoline-powered vehicles and 8 were electric vehicles of various types. Of the eight models available, three were represented by a gasoline-powered vehicle and at least one electric vehicle, enabling intra-model comparisons. Vehicles were driven over a 16.3 km test route. Each vehicle was equipped with six EMDEX Lite broadband meters with a 40-1,000 Hz bandwidth programmed to sample every 4 s. Standard statistical testing was based on the fact that the autocorrelation statistic damped quickly with time. For seven electric cars, the geometric mean (GM) of all measurements (N = 18,318) was 0.095 µT with a geometric standard deviation (GSD) of 2.66, compared to 0.051 µT (N = 9,301; GSD = 2.11) for four gasoline-powered cars (P < 0.0001). Using the data from a previous exposure assessment of residential exposure in eight geographic regions in the United States as a basis for comparison (N = 218), the broadband magnetic fields in electric vehicles covered the same range as personal exposure levels recorded in that study. All fields measured in all vehicles were much less than the exposure limits published by the International Commission on Non-Ionizing Radiation Protection (ICNIRP) and the Institute of Electrical and Electronics Engineers (IEEE). Future studies should include larger sample sizes representative of a greater cross-section of electric-type vehicles.